Danny Fox is on the verge of leaving Nottingham Forest for fellow Championship side Wigan Athletic. The experienced defender has been linked with a move to the Latics for the past week and it appears the deal is close to completion. 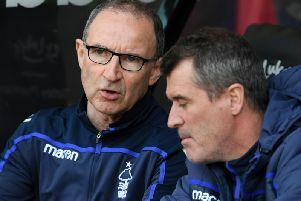 Fox missed Saturday’s match between the two sides despite a defensive shortage at the City Ground for new Reds boss Martin O’Neill. Full back Jack Robinson shifted inside to partner recent addition Yohan Benalouane in central defence while Ben Osborn filled in once more at left-back. But it seems that Fox’s five years with Forest will come to an end, with Paul Cook taking the 32-year-old to Wigan. Meanwhile Anel Ahmedhodzic has joined Malmo and fellow defender Alex Iacovitti has gone to Oldham Athletic on loan. Iacovitti, 21, has two first team appearances for Forest under his belt before loan spells at Mansfield Town and Forest Green Rovers.